Like many social media sites Facebook has brought many benefits to businesses, helping them to connect with their current customers and potential new customers. Take this example - you provide a service or a product, and customer Jenny Jones is very pleased. Jenny Jones likes to use Facebook and tell her friends and family what she has bought, where she has visited and to promote the great bargains and deals she has purchased. Your customer Jenny visits your website and clicks on your website. Your website then gets listed into Jenny's Activity Log on her Facebook page so all her friends can see. Promotion of your business from Jenny to her friends and family. Increased awareness of your business - service and products. Additional likes from Jenny’s friends and family that also like your website or webpage. Possibly increased sales from Jenny’s friends and family that like your products or services. 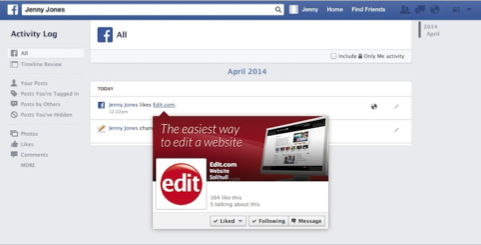 Don’t forget that with an edit.com website you can turn on Facebook Likes on every page with just one click.